Apple cider vinegar is a fermented & naturally inoculated product, which converts into an acidic and flavourful food ingredient. Our apple cider vinegar is made from our own pure apple juice, fermented into hard cider, and inoculated with natural “mother-of-vinegar” bacteria. Making apple juice into cider vinegar preserves the flavours for long-term storage as a safe food product. 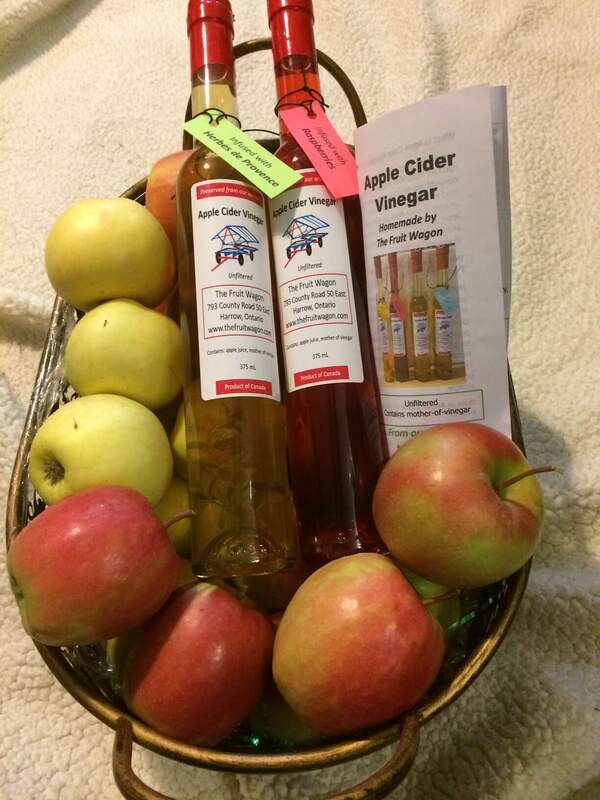 Apple cider vinegar was made by the pioneers because it is highly valuable for preserving and flavouring food. More recently, ACV is also popular for health uses, especially unfiltered product that contains the mother-of-vinegar. 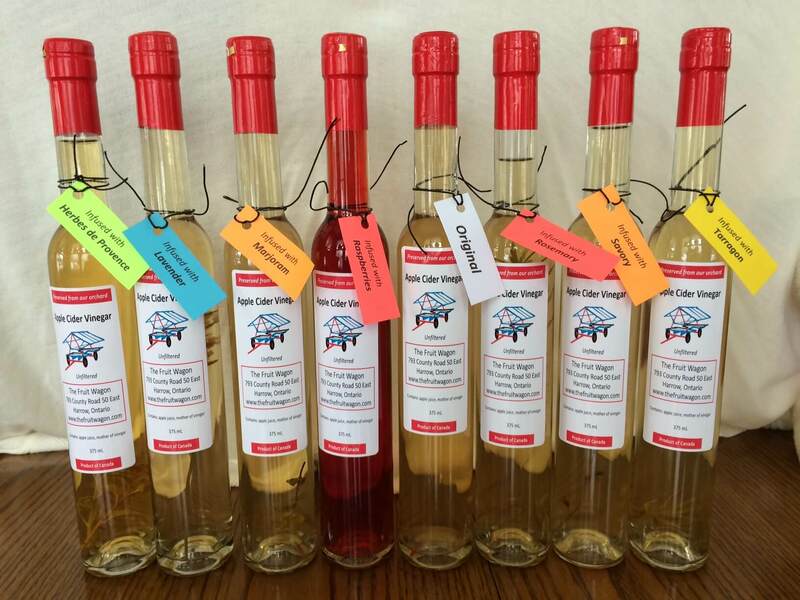 Our Apple Cider Vinegar starts from pure apple juice, freshly pressed from our apples at our farm. We ferment it with yeast for about 2 months, then add mother-of-vinegar. This converts it into apple cider vinegar over the next 2-6 months, depending on the temperature. When the conversion to acetic acid is complete, we can bottle the original vinegar, or we can infuse it with either raspberries or herbs. What does Apple Cider Vinegar taste like? A mixture of apple varieties with both sweet and acidic flavours is used when pressing the juice, which produces a balanced and “appley” flavour. Infusing the original juice with our homegrown raspberries and culinary herbs further produces interesting flavours in the apple cider vinegar. Can I drink Apple Cider Vinegar? Apple Cider Vinegar is highly acidic, so be sure to sip it slowly. Some people like to drink it straight, but some prefer to dilute it with either hot or cold water. © 2017 The Fruit Wagon. All rights Reserved.